As thousands of refugees arrive every day in Germany, calls are growing louder from business leaders in Europe's biggest economy to offer them jobs. "If we can integrate them quickly into the jobs market, we'll be helping the refugees, but also helping ourselves as well," the head of the powerful BDI industry federation, Ulrich Grillo, said this week. For the countless Syrians, Afghans and Eritreans fleeing war and oppression in their home countries and seeking refuge in Europe, Germany is their chief destination, as it is for Kosovars and Albanians. 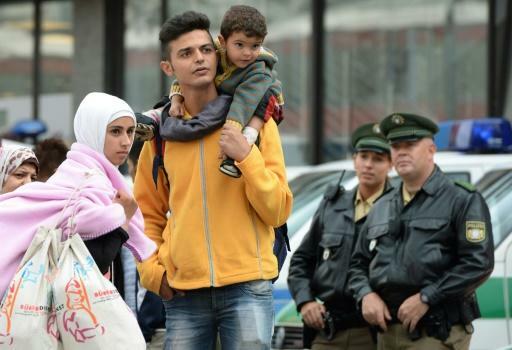 Europe's top economy expects to receive 800,000 asylum seekers this year -- a record figure. Beyond the humanitarian imperative to offer protection, businesses are increasingly seeing an economic case to keep the asylum seekers, particularly since Germany's rapidly ageing population and low birth rate are slowly depleting its pool of skilled labour. At 6.4 percent, unemployment in Germany is currently at its lowest level since unification, but the employers' federation BDA estimates the country is still short of 140,000 engineers, programmers and technicians. The healthcare and leisure sectors are also wringing their hands for qualified workers. In all, some 40,000 training places across all sectors are expected to remain unfilled this year. The Prognos think-tank forecasts the shortage of qualified workers will rise to 1.8 million in 2020, and as many as 3.9 million by 2040, if nothing is done. The influx of migrants could therefore be the answer as many of them are young and have "really good qualifications," said Grillo at BDI. Already, at a local level, more and more businesses are opening their doors to the new arrivals, encouraged by new initiatives. In the Augsburg region of Bavaria in south Germany, for example, the HWK local Chamber of Crafts has appointed an "intercultural advisor" to deal specifically with the issue. And the advisor has succeeded in placing 63 young refugees in a training scheme since the start of the year. In order to copy and amplify the success of such schemes, the head of the BDA employers' federation, Ingo Kramer, has called for "efforts at all levels". His call was particularly aimed at Germany's leaders, said Alexander Wilhelm, who is in charge of labour market policy at the BDA. "It's up to the government to act" by easing the rules on access to jobs, Wilhelm told AFP. Companies want a guarantee that a trainee they take on will not be deported from one day to the next. Businesses must also currently prove that there is no German candidate to fill a position before they hire a refugee or asylum-seeker, a rule which the Labour Agency would like to see abolished as soon as possible. On businesses' wish list of things are the speeding up procedures for recognising professional and educational qualifications, assessing arrivals' qualifications upon registration and putting more money on the table to help them learn German. This is because "to enter the labour market or secure an apprenticeship, there is generally a lack of German language skills," said the head of the Chamber of Crafts, Holger Schwannecke. The German government does not seem to lack good intentions. "People who arrive here as refugees should quickly become our neighbours and our colleagues," said Labour and Social Affairs Minister Andrea Nahles, whose ministry in late July relaxed the conditions for refugees to access company internships. "A lot has already happened," said Sait Demir, intercultural advisor at HWK in Augsburg. But among Chancellor Angela Merkel's conservatives there is still much resistance to being perceived as too welcoming. Her party opposed an immigration law demanded by the coalition partners, the Social Democrat party, that would simplify access to the labour market. The conservatives are also worried that finding work or an internship might be used by some asylum seekers as an insurance policy to stay in Germany even if their request for refuge were denied. Coalition vs Labor: How much money will women get?